Ansonia senior Trinity Henderson takes a shot in a game against National Trail on Thursday. Henderson finished with 18 points albeit in a 54-39 loss for the Tigers. 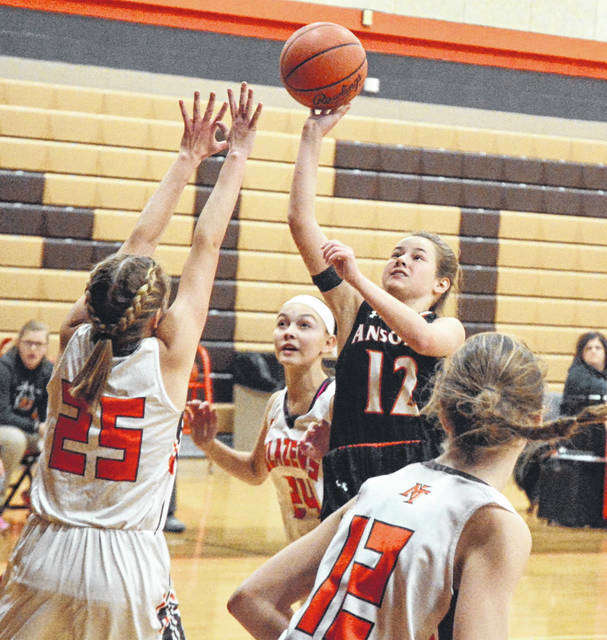 Ansonia’s Abigail Powers (12) takes a shot with several National Trail players surrounding her in a Cross County Conference game on Thursday. The Blazers won the game, 54-39. 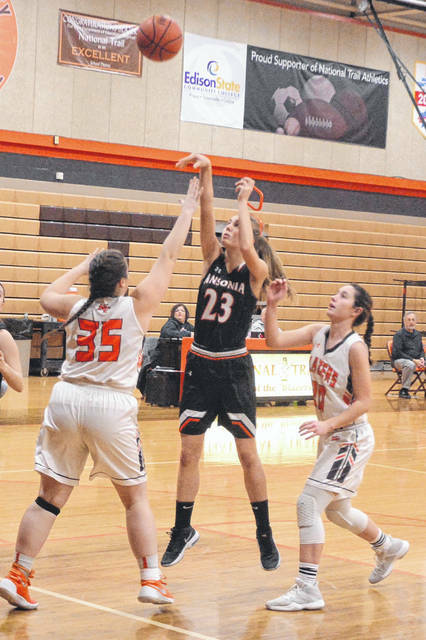 Ansonia’s Kierra Reichert (23) takes a shot with a pair of National Trail players surrounding her in a Cross County Conference game on Thursday. The Blazers won the game, 54-39. Ansonia’s Mariah Troutwine (2) takes a long-range shot in a Cross County Conference game at National Trail on Thursday. The Blazers won the game, 54-39. Ansonia’s Rylie Marker (34) looks for somewhere to pass the ball during a Cross County Conference game with National Trail on Thursday. The Blazers won the game, 54-39. 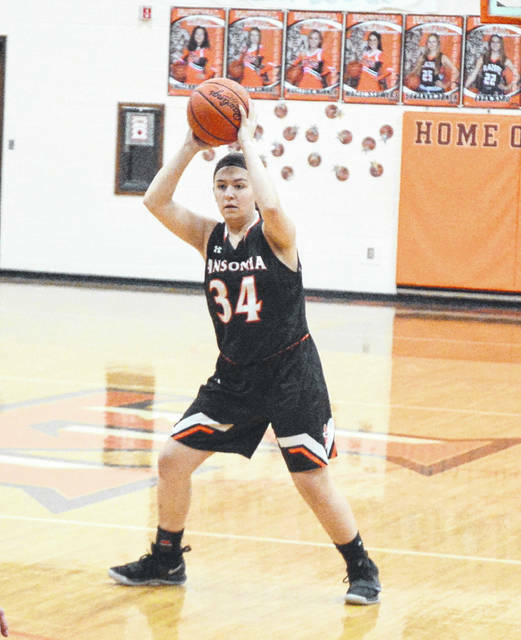 NEW PARIS – The visiting Ansonia Tigers got off to a slow start against the National Trail Blazers on Thursday and ended up falling to their Cross County Conference host 54-39. Ansonia quickly fell behind by 10 points and although they closed to single digits a time or two, National Trail maintained a double digit lead most of the game. The Tigers had a difficult time scoring points consistently against the Blazers man-to-man defense. Initially, Ansonia started with a zone defense. But Blazer Makena Laird was hitting outside shots, so Coach Jim Bolin took a timeout and switched defenses to a man-to-man. 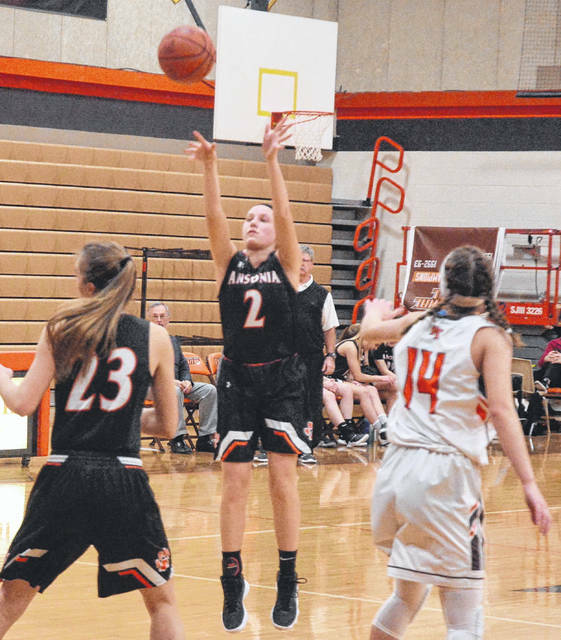 They made some offensive adjustments as well and thanks to a buzzer-beating shot from downtown by Trinity Henderson Ansonia was down 18-10 at the end of the first quarter. 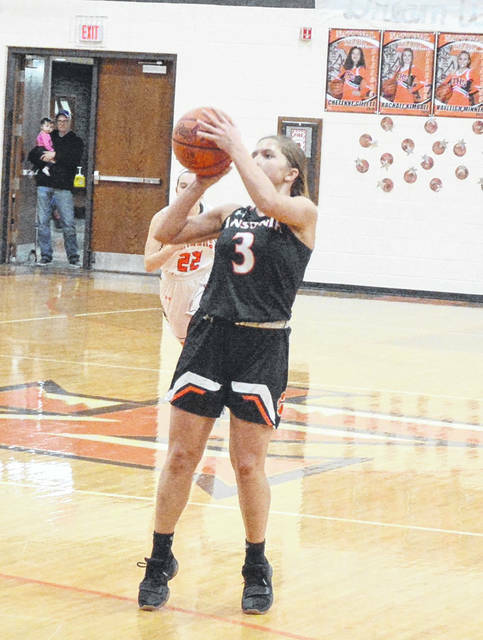 Makala Stover scored a trey with about 10 seconds left to go in the half, but still the Tigers found themselves on the wrong side of a 38-24 score as they went to the locker room. In the second half, the Tigers could not gather any momentum to make a run at the Blazers. The Blazers did mix things up a bit by going to a zone in the last quarter, but the Tigers could not make much headway against that defense either. “We had a rough start,” Coach Bolin said. “But we adjusted and played better – we actually won the fourth quarter. We did not execute our offense like we should have. We had problems getting rebounds – they have a real aggressive team. The Trail coach did a good job of preparing them for this game. Ansonia scoring: Henderson 18, Marker 13, Stover 8, Emma Barga 2, Kierra Reichert 2. Marker led the team in rebounding with 5 and Henderson led the team in steals with 3 and had 2 assists as did Stover.